Well, that's us well into the busiest part of the year - most weekends for the past month or so have been pretty hectic with a huge number of groups visiting and taking part in activities. 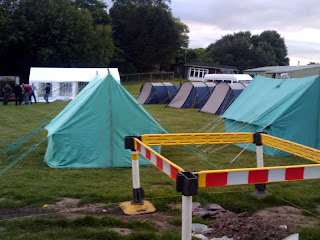 Most weekends have seen around 12 staff in to help out (some weekends with nearly 20 over the whole weekend!) but luckily the weather's been fantastic in general, although maybe a wee bit hot for some of us. 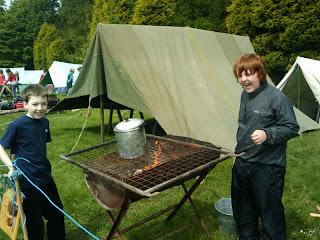 This weekend sees the biggest event of the year, a centenary camp for Dunfermline District Scouts with nearly 800 expected in total. 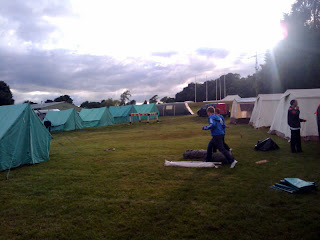 Most groups have already been in to set up their tents and equipment in advance so that they can just turn up on friday and get started with the programme. The site's looking pretty good; the dry spell has helped dry out the notoriously wet areas although some other bits of the grass have suffered a bit with the heat which will make it hard to get tentpegs in! The new grasscutter arrived a few weeks ago and has been much in use already - we should have a few action photos here soon for all you machinery freaks out there. We bid a sad farewell to the trusty old tractor, but wish it well for its future life. 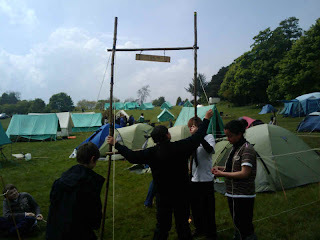 Aside from the usual activities, there have been a few other events recently including the annual Gibb Bugle and Totem camping competitions for Dunfermline and Rosyth district scouts respectively. 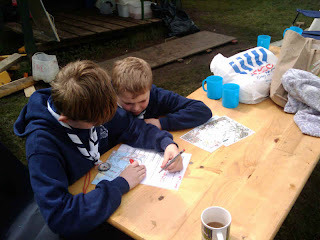 These are both run together to maximise the use of leaders/judges, and over a period of 2 days patrols from each group are tested in a variety of ways to give them the chance to show how good they are at campcraft, cooking, mapwork, gadgets, etc. A good weekend seemed to be had by all, the only downside being event leader Graeme having a freak accident which resulted in a broken ankle so we wish him a speedy recovery. 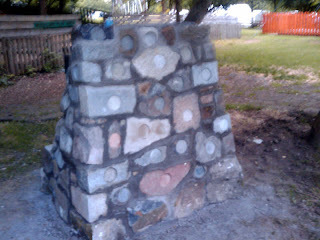 Another new sight at Fordell is a curious monument which has appeared on the front lawn (next to the Richmond Chalet). 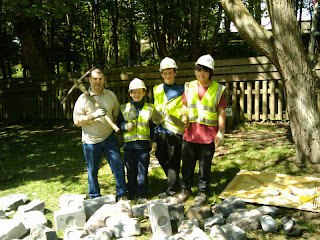 This is going to be the centenary cairn and will be comprised of individual stones which have been donated by scout districts and areas across Scotland. 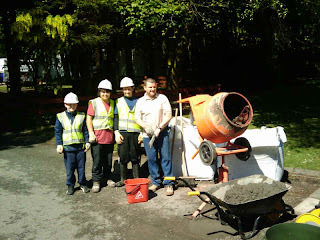 The work is being carried out by a leader from Edinburgh who is also a stonemason (and some of his scouts), and is pretty much finished now - just awaiting the arrival and attachment of individual metal plaques which will go on each stone to show who donated. If you're on the site, why not have a wee wander and check it out? 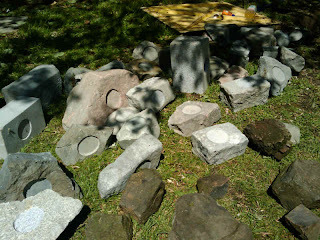 Above : (Nearly) finished centerary cairn looking good - just waiting for plaques. Lastly, a fantastic free competition for you all to take part in. Just answer the following question and you could win a wonderful Fordell Firs comb. Q. 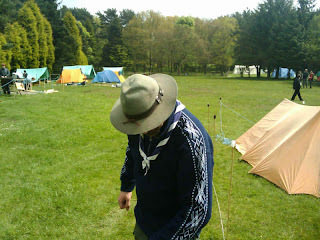 Who is this well-known local leader who is trying to hide his identity during the camping competition? The first winner picked out will receive a free comb (but will require to pay courier charges of £25.95 before despatch). 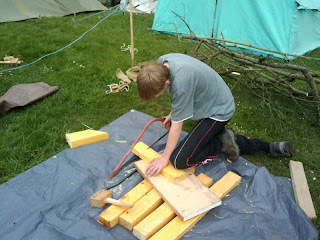 That's all for now, but we'll have another update next week with lots of photos from the district camp. Have fun and look back soon.